Don’t forget to check the tire pressure of your spare tire as well as your regular four. With Memorial Day weekend just around the corner, AAA projects that over 30 million Americans will travel during those three days alone. For the entire summer travel season, which runs from Memorial Day weekend to Labor Day, the organization estimates that 8.7 million motorists will get stranded on the roadways. Don’t be one of them by making sure all five of your tires are properly inflated. While we can’t prevent every possible disaster that can happen on the road, we can at least make sure our tires are properly inflated and stay that way throughout the summer. The best way to do that is to utilize nitrogen tire inflation. Nitrogen tire inflation is simply filling up your tires (or topping them off) with nitrogen instead of air. Nitrogen enables more stable tire pressure for longer periods of time, thereby reducing the chances for a blowout. That’s good news if you’re planning to drive at some point during the travel season. Properly inflated tires also can reduce fuel costs during a trip. The Department of Energy reports that correctly inflating all four tires can improve fuel economy by up to three percent, which is equivalent to as much as to 12 cents per gallon. As rising gas prices are doing little to keep Americans at home this summer, any and every way to save gas money is a good idea. So, where can you go to get your tires inflated with nitrogen? Is this a service you can just ask for at your local mechanic? Well, not yet. But, a recommended dealer of these hybrid tires is Nitrofleet99. Keep in mind that it’s not necessary for you to remove all the air from your tire before seeing the benefits of nitrogen. You can still just top your tires off with nitrogen to keep them properly inflated. Pump your tires green with nitrogen tire inflation! Managed fleets are part of the solution, NOT part of the problem in reducing fuel usage and carbon emissions on a very large scale. It’s simply about making a more efficient use of the resources we have, especially with our tires and what we put in them. A study from the American Automotive Leasing Association found that in 2007, managed fleets saved over 400 million gallons of fuel. Given that the United States consumers about that much in a single day, this savings represents progress toward reducing our dependence on foreign oil. This study also found that a managed fleet results in a more efficient use of fuel and a reduction in carbon emissions because the managed fleet model is structures around efficiency. Do you have a managed fleet business model, or you want to make your current fleet more efficient? Well, here’s one way: nitrogen tire inflation. By putting nitrogen into your tires instead of air, or even just getting into the habit of topping off your tires with nitrogen, you make your tires hybrid in an instant. Over 300 million tires are disposed of annually. Nitrogen tire inflation can reduce this number by 30 percent if only more fleets and consumers embraced the practice. Air also leaks from three to four times faster than nitrogen. So, you know those great strides managed fleets made in reducing carbon emissions and saving all that fuel? All that goes down the drain if your tires aren’t the proper pressure. These hybrid tires create savings in three ways: improved fuel efficiency, reduced carbon emissions, and extended tire life. To calculate your fleet’s savings with Nitrofleet99 Hybrid Tires, then use our carbon reduction calculator to figure out the exact savings! At Nitrofleet99, we promote sustainable business with better use of our natural resources by providing nitrogen products and services that achieve environmental gains. Specifically, we offer a Carbon Credit Program for managed fleets. 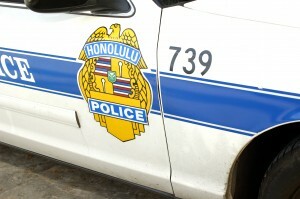 Police vehicles like this one can have their life extended with nitrogen tire inflation. Photo by Jaymast. Law enforcement agencies all across the country have committed to nitrogen tire inflation programs in order to increase safety and to cut costs in fleet maintenance. One of the first police departments in the United States to embrace nitrogen tire inflation is the Garner Police Department in North Carolina. Although other studies have found that the percent savings on gas mileage is closer to three or four percent, those savings do add up when it comes to a large fleet of law enforcement vehicles, especially in these tough economic times. Whether those savings are seen in the fuel efficiency, in an extended tire life (a tire that’s 20 percent under-inflated will have a 15 percent shorter life), or in reduced maintenance costs, nitrogen tire inflation is an easy way for law enforcement agencies to save money when budgets are only getting tighter. But the smallest things can make a big difference, as is seen by the The Kingsport (Tennessee) Police Department. Kingsport started using nitrogen in their vehicle tires a few years ago, and noticed a difference in performance within six months. “Since I’ve had the nitrogen in my tires, I’ve never had to touch the tires,” Kingsport Officer Tom Wayt said on PoliceOne.com. The city is citing preliminary data showing not only better gas mileage but better wear on the tires. Sergeant John Zoller of Broken Arrow, Okla. agreed to the long term benefits of utilizing nitrogen tire inflation in law enforcements fleets. This is especially important for law enforcement fleets since these vehicles acquire put on a lot of miles in one year. “We really should look at nitrogen for our fleet of vehicles and specifically within law enforcement. The increase savings in gas mileage and tire wear would certain prove its worth in time,” Zoller said. If a typical tire costs $100 and a department sees a 10-percent increase in tire life by using nitrogen tire inflation, then that’s a savings of $10 per tire or $40 per car. If tires are replaced about every 10 months, a 10-percent increase in life extends the tire life to just under one year. So every year, each car saves approximately $40. If there are 100 vehicles in a department’s fleet, then a switch to nitrogen tire inflation can save $4,000 per year. However, only 10 percent of tire dealers nationwide offer nitrogen tire inflation services. If you’re considering nitrogen tire inflation for you or your fleet, and have trouble finding nitrogen service, then consider Nitrofleet99. This is what oxidation can do to your tires. Prevent it with nitrogen tire inflation! 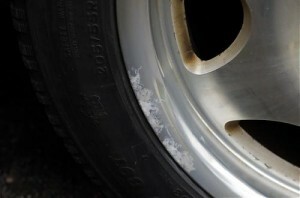 Oxygen and moisture are destructive to your tires. Oxidation can cause bubbling or flaking of the chrome finish as seen to the left, which at that point can degrade the base material of the wheel itself. Since water vapor also permeates the tire rubber, it can separate the layers and even rust the steel belts, making for an extremely unsafe driving condition. Deterioration from oxidation isn’t localized. It spreads. It can start within the tire interior and moves outward, where it first invades the tire liner and then consumes the insulation rubber adjacent the liner. 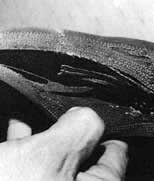 It marches inexorably outward, and as it does, the rubber itself deteriorates, losing elasticity. This decay is constantly being fueled by the fresh, and all too often moist, air injected. It sounds costly! So, how do you prevent this and make your tires last Million Mile Tires? One way to do it is with nitrogen tire inflation? Nitrogen tire inflation takes the air and the water vapor out of your tires, and replaces it with nitrogen. Yes, air is 78 percent nitrogen, but it’s the other 22 percent that’s causing problems. It’s such a simple solution that doesn’t require a whole lot of extra time or expertise to get it done. To learn more about nitrogen tire inflation, check out Nitrofleet99. Nitrogen tire inflation can keep your tires healthy!